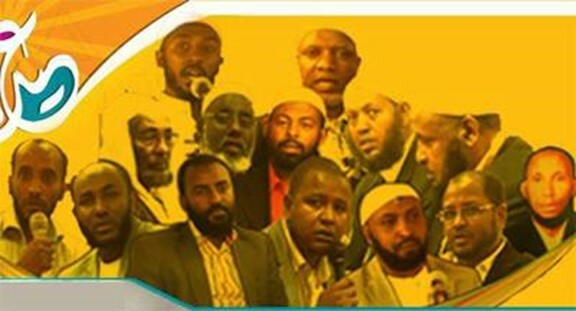 The state trials of two years long against the members of the Ethiopian Muslims Arbitration Committee, a body delegated by a collective of individual Muslim communities from throughout Ethiopia, concluded with the expected guilty verdict on July 6, 2015, though the ruling had arisen from no basis. The kangaroo court, held under the leash of the ruling regime, has time and time again demonstrated its purpose to be to advance the political agenda of the TPLF instead of the cause of justice. The court shamelessly reached its empty guilty verdict despite the political prosecutor’s failure to produce any tangible evidence supporting the charges against the Arbitration Committee members. However, there was no lack of coached and coerced eye witnesses as well as fabricated and doctored video & audio evidences. Because of our leaders’ relentlessness in maintaining their innocence and their refusal to relinquish their God-given freedom of religion, they are now prone to the subjugation of a greater deal of unforeseen inhumane treatment. Their support network, however, will continue to stand by them and ensure that justice prevails in the end. For the last several years, the Ethiopian government has been insisting that Ethiopian Muslims must accept and associate themselves with the Al-Ahbash cult whose main tenets go astray from the fundamental doctrines of orthodox Islam. The government had achieved its goals of infiltrating the Muslim community first by appointing members of the sect to the Islamic Affairs Supreme Council (IASC), then by imprisoning Imams who refused to cooperate and replacing them with Ahbashi political associates. Despite the glaring mountain of evidence, the Ethiopian government has consistently denied the accusation of imposing this sect upon its Muslim population, but its blatant denial has only been an evasive path for them to continue with their despotic interference in the communal affairs of its religious communities. The Arbitration Committee, a unique delegation composed of religious leaders and scholars, elderly and young alike, as well as intellectuals from different fields, was initially recognized by the Ethiopian government as the genuine representative of the voice of the 40 million Muslims who elected them, as was evident by their engagement in a 7-month long negotiations with the committee prior to turning the tables and reversing its disposition. The purpose of these negotiations was to find a solution to the three demands of the Muslim community which included: 1) Letting the Muslim community elect the their own officers to the IASC; 2) Returning the administration of Awoliya College, the only Islamic higher education institute in Ethiopia, to the Muslim community; and 3) Ceasing the imposition of the Ahbashi ideology on the Muslim community. These demands concerned constitutionally-endowed freedoms, namely the separation of religion institutions from the state, which are recognized to be the cornerstones of any secular society but were implicitly denied to Ethiopian society, despite the principle’s constitutional presence. In recognition of this principle, the Muslim community leaders requested that elections to the IASC be held on the grounds of each voting district’s respective mosques instead of government-controlled precincts. The government denied this proposal, and in doing so transgressed the limits of its power by controlling the election process. Not only did the government fail to meet their demands, but afterwards rounded up the Muslim community delegates and threw them in jail under the false pretext of terrorism and plotting to establish an Islamic government, simply to make matters worse. Peaceful demonstrations ensued as the discontented Ethiopian Muslim community coordinated itself on the grounds of its mosques to collectively show the TPLF government that their demands cannot be overlooked. In response, militiamen were sent to arrest any dissenters and the rally organizers. As a result, today, there are thousands of Ethiopian Muslims languishing in prisons across the country in horrible conditions. Because of this regime’s deliberate failure to abide by the rule of law, so many champions of civil liberties are suffering at the hands its security forces. Those who can are leaving the country, contributing to the already grave refugee crisis plaguing the country. The sentencing of the Ethiopian Muslim community leaders is set for August 3, 2015. Regardless of the outcome, the struggle of the Ethiopian Muslim community will continue. These heroes standing strong in the face of injustice were born from this movement, not vice-versa, and as such, we will continue to march forward until our demands are wholly addressed, an inevitable result notwithstanding the time it will take. No doubt, invigorated and functioning still, the peaceful struggle of the Ethiopian Muslim community is on a trajectory to success. The effects of this movement alongside others in Ethiopia will certainly shape the nation’s future civil and political atmosphere.